This is the first collection of critical essays devoted exclusively to Shakespeare's first published work, his long narrative poem Venus and Adonis which established his reputation as the literary darling of London and the heir of Ovid. 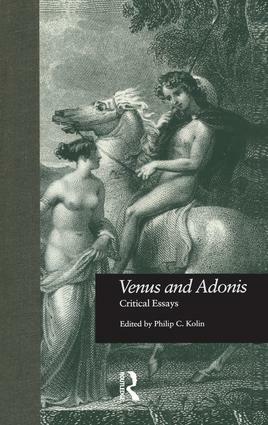 Particularly important is the book's coverage of the little-known presence of Venus and Adonis on stage.A substantial introduction of 65 pagessurveys the history of criticism about the poem and its significance, and addresses such issues as the burdens of readership and the poem as a staged production. Following are 19 reprinted works from the 18th to late 20th centuries and seven original essays by leading scholars that examine the poem from a variety of theoretical and critical perspectives-Lacanian desire, semiotics and Elizabethan wardship, female readership, mythology, aesthetics and art history. An extensive chronological bibliography of scholarship, editions, and theatrical and literary reviews makes this volume indispensable. These comprehensive critical collections are a must-have for students, libraries and scholars alike. Each volume gathers the most influential criticism, key contemporary interpretations and reviews of the most influential productions of Shakespeare's masterworks.